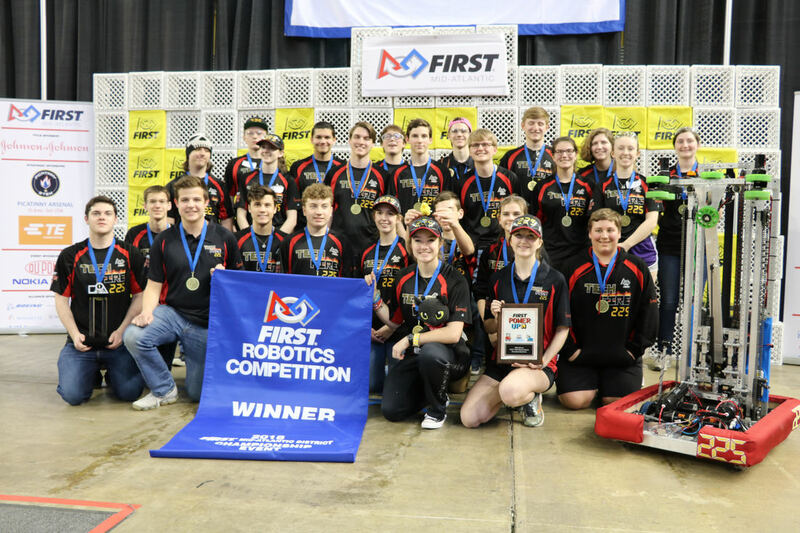 York-based competitive robotics team, TechFire 225, qualifies for the FIRST Robotics Competition World Championship in Detroit, MI on April 25 - 28. York’s premiere robotics team set the Mid-Atlantic Region on fire when its top seeded alliance took the top place among more than 60 competing teams. “This is a year where we have had a lot of great opportunities. 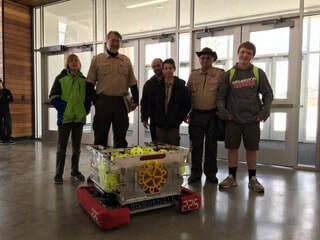 We have a really robust robot, a really strong scouting team, and we’ve got some solid mechanics to back it all up,” says Jagr Krtanjek, one of 225’s Drive Team members. Watch history being made at the FIRST World Championships at Cobo Center in Detroit, Michigan on April 25 - 28. Visit firstinspires.com and www.firstchampionship.org for more information. 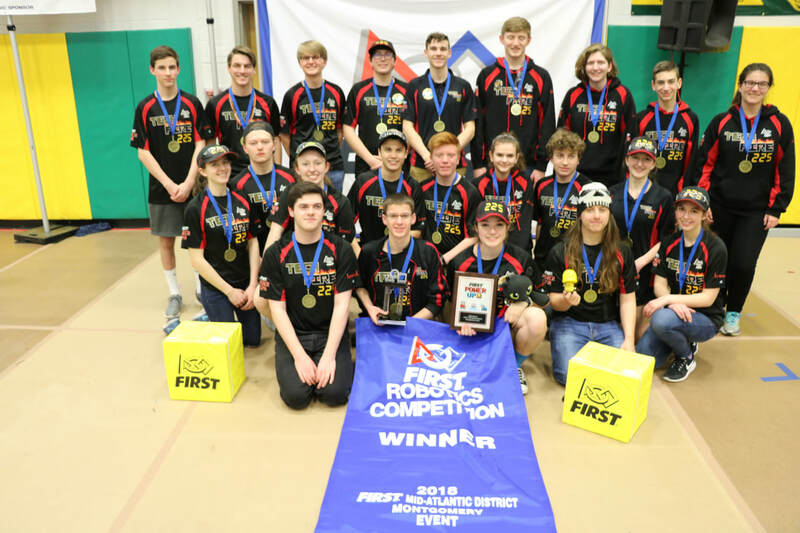 TechFire, York’s premiere competitive robotics team set the district on fire when it received two prestigious awards at the Mid-Atlantic Regional Qualifier of the FIRST Robotics Competition in Montgomery, New Jersey on March 25. Combining the excitement of sport with the rigors of science and technology, the FIRST Robotics Competition is the ultimate sport for the mind. For its unique robot design, TechFire was awarded the Industrial Design Award. Sponsored by General Motors, this award celebrates form and function in an efficiently designed machine that effectively addresses the FIRST Robotics POWER UP game challenge. Along with its alliance partners, Team 25 Raider Robotix of North Brunswick, New Jersey, and Team 5992 the Pirates from Seton Hall Prep in West Orange, New Jersey, Team 225 TechFire competed throughout the weekend and battled through the playoff rounds to win the District Event. Winning the event qualifies all three teams to compete at the FIRST Mid-Atlantic District Championship Sponsored by Johnson & Johnson on April 4 - 7 at Lehigh University’s Stabler Arena. Winning teams will then move on to the FIRST World Championships on April 25 - 28 in Detroit, MI. These past five weeks have been a whirlwind of prototypes, powerpoints, CAD drawings, and perpetual progress. It seems like just yesterday we were finding out what the game was, and waiting eagerly for the reveal of this year’s water game. Now, at the end of the beginning of an incredible journey, we stand awaiting the trials and tribulations of the impending competitions. Overall, build season has been a rollercoaster of ups and downs. "In the beginning, everyone is really excited, and there is lots of stuff to do, and at the end there are a lot fewer things to do, there is a lot of a tweaking and programming. But, that's when we are getting ready for competition and are really excited," says 12th grader Michaela. Build season is a six week period where the team prototypes and tests multiple designs in order to form a more perfect robot. Throughout this period we watched students step up, from rookies to seniors. We saw what started as dreams on paper became a physical, working robot. No matter how many years you’ve been a part of FIRST, it’s always astounding how the team bonds and friendships develop as our robot slowly becomes an engineering masterpiece Throughout build season we’ve made countless memories. Many being preserved forever on the famous ‘Quote Board’ that sits proudly on our shop wall. From teamwide games of Superfight and Mafia to sitting down for TechFire family meals together, we are creating moments we will never forget. As we enter into the competition, we can’t wait to make more with our friends and family. After a rigorous first three weeks of build season, students from TechFire were challenged to brainstorm ideas on how to put the good ole’ TechFire spark out on social media. 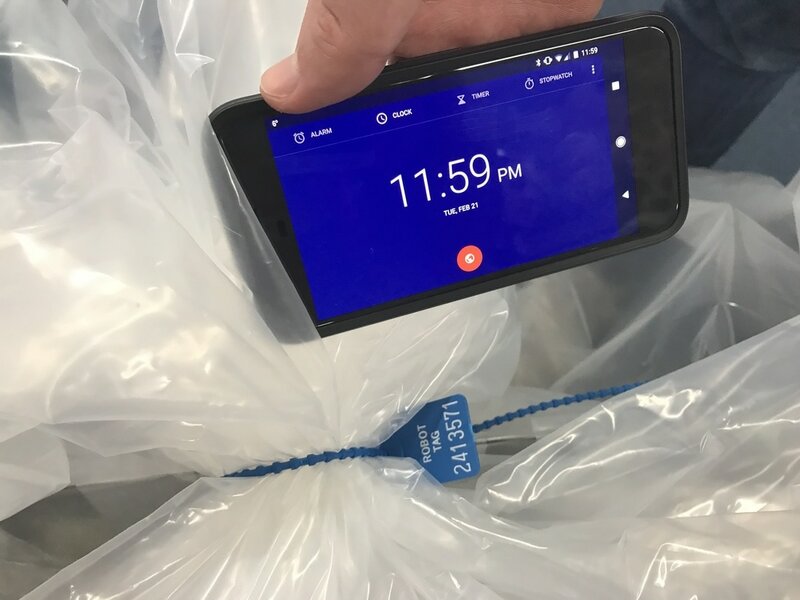 Meetings spent sifting through Instagram, Facebook and Twitter to gain knowledge about the pros and cons of each medium have certainly paid off. Students decided that a weekly media post seemed to be the happy middle ground for consistency without overpowering our followers with posts. Every Tuesday, our followers can be sure to look out for our weekly TechFire Tuesday post which will include our “What the Tech? !” segment for the week. Inspired by the National Geographic World magazine feature called “What in the World,” TechFire’s students came up with the brilliant idea of having our followers play a little game each week. The game “What the Tech? !” will feature a magnified picture of a robotics themed object. These objects range from robot parts, outreach presentation items, and even the occasional game piece. Followers will then have the chance to guess in the comments what the object is and we will reveal the answer on the following week along with the next challenge. Thank you to our amazing follower base for playing along with this exciting game that is not only fun to play but even more fun to create. Be sure to checkout TechFire on Instagram, Twitter, and Facebook and we will see you on TechFire Tuesdays. As always, stay forever fiery. On January 6, 2018, a team of high-school students from 13 area school districts filed into the York Country Day School. 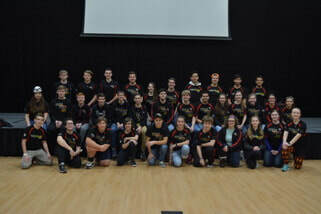 These students are members of York County’s world-class robotics team TechFire 225, and are ready to kickoff their next season of STEM competition entitled POWER UP. Competing within the FIRST (For Inspiration and Recognition of Science and Technology) Robotics Competition program (FRC) includes 6,770 other teams from across the world. Teens work with adult volunteers, called mentors, who train students to become strong leaders and creators and oversee the student's progress. TechFire hopes to achieve the same success as their previous years by creating a robot ready to engage competitors from across the globe. In 2017, TechFire finished the year ranked #21 according to FIRST Updates Now. Nadine Hubner, a representative of Scott Wagner’s office, was present to show the State Senator’s support of STEM. When asked for her thoughts on the program, she said, “FIRST has so many positives to it, even if a student doesn’t decide to go into engineering. All the skill sets...and the problem solving you learn you really take into your life. So I think it’s a really great thing to do and it’s fun. I wish they had this when I was a kid.” These skills have allowed TechFire alumni to attend universities for engineering such as Yale, Syracuse, and Penn State. Additionally, students gain access to hundreds of scholarships, totaling over $50 million, available only through the FIRST program. This kickoff sparks a six week period in which students will need to design, build, and program a functional robot to compete in challenges over the next few months. With the right strategy, TechFire 225 may qualify for district, and even world events, as they have for the last 5 years. For more information on FIRST or POWER UP, please visit www.firstinspires.org. Follow this season’s team action at www.techfire225.com. .